Independence «joys»: Who is to fill the Uzbek budget? Collecting money from the population is the main topic discussed in general assemblies and sessions at every state-funded organization in Uzbekistan with no exceptions whatsoever. 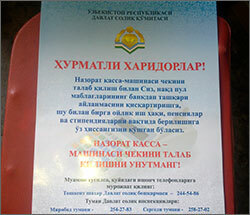 For instance, the Uzbek tax committee posted last week this colorful poster urging to use banks to collect and store cash, to demand receipts “to promote decreasing non-bank financial operations and to reach timely payment of salaries, pensions and benefits.” In other words, dear shoppers and vendors, the country’s economic prosperity allegedly depends on your consciousness in such matters. All the while, it is no secret for both parties that buying-and-selling using said receipts is clearly disadvantageous and only a whip would perhaps be able to force a retailer to issue them for shoppers. According to the retailer, every store in Tashkent works in a similar manner; otherwise “they would lose profit.” And when problems with the tax offices arise, they use their “own” tax inspectors’ “services.” Moreover, city and district-level administrators daily visit shops, cafes and restaurants to force their owners to “voluntarily contribute” to improving the neighboring areas (the upcoming Independence Day is certainly one of such events), including the maintenance of nearby apartment blocks’ facades. “Chosen ones” are free from using banks? A regular businessman in Tashkent City is obliged to monthly pay the highest tax in the country—ten minimal salaries plus one minimal salary to pay the Pensions Fund plus the store rent totaling just over $700. However, taxes for such hypermarkets as Abu-Sakhiy, Bek-Baraka and others, which are physically located in Tashkent Region, do not exceed even three minimal salaries! That said, although registered as regular retailers, these trading houses trade with largest amounts of wholesale product deliveries (mainly Chinese products) in the country. No taxes paid and no problems faced? For a clearer picture, let’s a take a virtual tour of the Abu-Sakhiy market and make some simple calculations to see the scales of mindboggling amounts of unreported cash flow. So, there are 133 stores for shoes wholesale, which were sold for $60,000 each. A minimum price for a pair of men’s shoes is 45,000 soums ($21); a box contains 12 pairs (540,000 soums). One store has at least 200 such boxes (1,08 milion soums). Now, calculating the total amount of cash in all 133 stores gives 14, 364,000,000 soums ($6,827,000). The “boutiques” on the second floor carry enormous amounts of China-made jeans. The wholesale price for a pair is 50,000 (about $24); each package contains eight pairs (400,000 soums equaling $192). Each of the 149 stores carries at least 500 such packages: 29,800,000,000 soums (over $14 million). The Abu-Sakhiy hypermarket alone, reportedly, houses 418 stores. Every trader here is legally bound to pay the fixed tax in the amount of 10 minimal salaries. That means the fiscal bodies are obliged to collect 334,400,000 soums in taxes at this trading center every month (over 4 billion soums annually). I have a question for our tax inspectors, power-wielding bodies and MPs: Who established such beneficial terms and conditions for “private entrepreneurs?” Who has granted them those marvelous benefits and preferential treatments? The tax code is supposedly equally applicable on everyone in Uzbekistan, where theoretically everyone is equal before the law and Constitution. But why in reality some are punished to the fullest extent of laws for failing to issue even one receipt for several thousand soums, whereas others easily forgiven for concealing multibillion incomes in a foreign currency? According to local business owners, the status quo will lead Tashkent toward becoming a city of empty stores with flimsy budgets, while the socio-economic situation in the country is about to turn maximally critical when there are no funds to pay even pensions. Is it, then, surprising that able-bodied citizens, mostly young men and women, are fleeing the “country with great future” to work as janitors and builders in foreign countries to provide for their families in Uzbekistan and thus support their country’s economy?